Minimum quantity for "45 piece tray jigsaw puzzle" is 100. 45 piece tray jigsaw puzzle is a perfect solution if you are looking for something for your personalised giveaway. 45 piece tray jigsaw puzzle is approx. A4 size. You can personalise both sides of the jigsaw. Each tray jigsaw is individually shrink wrapped in pvc foil which means there is no need for boxes to present the jigsaw. 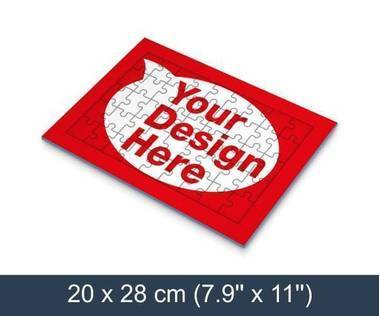 Tray jigsaw puzzles are great for marketing activities to promote your services.